MOUNT VERNON, Wash. – With a hybrid crop called Salish Blue, scientists at Washington State University have combined wheat and wheatgrass in a new species with the potential to help Pacific Northwest farmers and the environment. Salish Blue is just one variety of a new perennial grain species, ×Tritipyrum aaseae. It’s the first new species to be named by wheat breeders at WSU in 122 years of breeding. 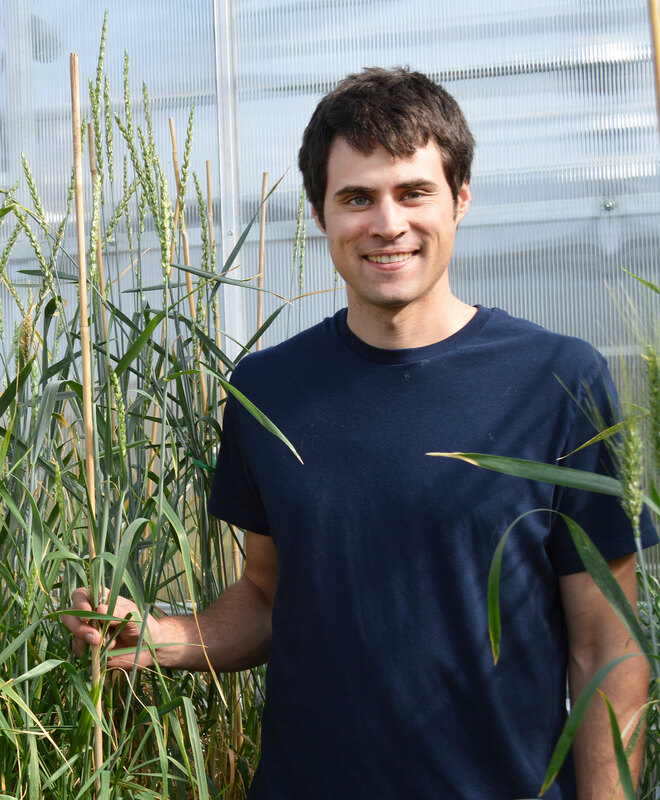 Colin Curwen-McAdams, a graduate research assistant at the WSU Bread Lab at Mount Vernon, and Stephen Jones, wheat breeder and director of the lab, describe development of the species in a recent issue of Genetic Resources and Crop Evolution (http://link.springer.com/article/10.1007/s10722-016-0463-3). Unlike bread wheat, which is planted and dies in a single generation, perennial grains hold the promise of bearing seed for multiple harvests. At the same time, perennial hybrids can bring ecological benefits to grain production. WSU graduate research assistant Colin Curwen-McAdams with ×Tritipyrum aaseae. Breeding Salish Blue, which was developed as a potential food and dairy forage crop for the Pacific Northwest, gives farmers new options. “We’re working with farmers to determine what Salish Blue will do and how it will fit with their rotations,” said Jones. For the past century, breeders around the world have been trying to develop a perennial grain crop from wheat and its wild relatives. Development of Salish Blue caps 21 years of work by WSU scientists to stabilize bread wheat-wheatgrass hybrids through classical plant breeding without using gene modification. Combining wheatgrass with bread wheat, which contains three separate genomes, posed a challenge. “It’s incredibly difficult to get what qualities you want, and hold on to them over generations, while not bringing along other things that aren’t desirable,” said Jones. The new species is named after professor Hannah Aase, who explored wheat genetics as a botanist and cell biologist at Washington State College, now WSU, from 1914 to 1949. She died in 1980. In their paper, Curwen-McAdams and Jones call for breeders and geneticists to contribute to nomenclature – how species are named – to advance the science of grain hybrids.